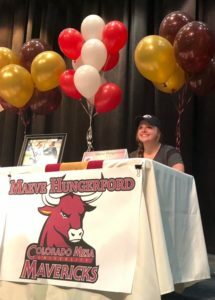 We would like to congratulate Maeve Hungerford on her commitment to Colorado Mesa University! Here are Maeve’s recruiting story and interview after her commitment. Good luck as a Maverick! I knew I wanted to play lacrosse in college early on. It is an intimidating process and despite all the camps, club, and tournaments I had no idea where I wanted to go to college, what constituted a “good fit”, or what I should be looking at with regards to lacrosse programs. My dad would talk to me about colleges, towns, or coaches and I just didn’t fully understand what he was talking about. After joining SportsForce in 9th grade, Coach Andrea Ervay was assigned to me as my mentor. We would talk by phone every few months and she would ask about my grades, how lacrosse was going and helped keep me on track. The one thing both Coach Ervay and my dad said was grades came first and lacrosse comes after. I definitely stalled out in my process during junior year. It was hard enough trying to handle school and lacrosse and I didn’t want to think about college yet. However, being with SportsForce helped as all communication that was or wasn’t doing was in a central place and easy to keep track of. Summer after my junior year, my dad helped me narrow down my options and then we visited campuses and met with coaches. While I hate to admit it, my dad was right in that going to the campuses was the most helpful thing in my recruiting process. There were quite a few D2 and D3 coaches that were interested and the websites for all the schools made them all look awesome. However, I didn’t realize how truly far away, or how I would feel on campus, the size of school I was looking for, and the geographic location until I got on campus. Visiting the schools really helped and I was able to rank them better after getting offers and an idea of location, cost, and lacrosse program. I was really surprised at the results. A few schools I had thought I really would like, I didn’t, and a few that I didn’t think I would like at all, ended up enjoying them. Ultimately I narrowed everything down and when I was offered by an in-state school (which I had always thought I wanted to go out of state) that I really liked the lacrosse coach and location/cost, it was an easy decision. If I hadn’t made all those visits, I think I might have made some choices I would regret. 2. What school are you going to, and why did you choose them? I will be attending and playing at Colorado Mesa University (DII) in the RMAC. Ultimately I decided to become a Maverick because the campus was beautiful, it had all the academic programs I needed and wanted, the facilities are unreal, and I really liked the lacrosse coach. Also, as I said before, I thought I wanted to go out of state, but everything seemed really far away when it got down to it. CMU is close enough to access my parents and friends in Denver but far enough away they won’t be randomly knocking on my dorm door. 3. How did SportsForce help in the process? SportsForce helped in many ways. For me, the constant reminder to fill out my contact sheet, the accountability knowing that I had to schedule a talk with Coach Ervay from time to time, and the ability to have all my recruiting stuff in one place ended up being crucial. My dad says that for him as a parent, it was really nice to deal with Darrell (Client Services) and Coach Ervay as his only contacts, that the site was easy to use and update, and that he only had to pay once for four years of ongoing help. The database of schools, coaches, and contact information ended up being really helpful. I didn’t realize this until some of my teammates started trying to get recruited and I realized what a struggle getting a film, making contact with coaches, and then keeping all that straight was. SportsForce truly made all that easy. 4. What advice would you give to other players and parents with the recruiting process? I would say that getting good footage of your play is key. Also, after meeting with many coaches during this process, I found that they don’t always want to see your best plays, they want to see everything. If you start using film from 9th grade and as a sophomore, you improved, it is ok to show how something wasn’t awesome but now it is. The coaches mentioned they like to see coachability and progress more than your most awesome plays (include those of course), or something where you made a mistake but showed hustle to get the ball back (the words tenacity, speed, and attitude come up a lot). My dad wanted me to be sure and mention that campus visits and patience were what helped most as a parent. I know he was frustrated with me but was kind enough to let me figure stuff out on my own to some degree. The visits helped because I really got a feel right away whether I liked the college or not. I talked to a lot of coaches on the phone and the campuses always sound awesome, but until I got there I knew pretty quickly whether it would make my short list or whether I wasn’t interested anymore. #1 piece of advice….. KEEP YOUR GRADES UP. It turns out both colleges and coaches want to know about those first before you even start talking about lacrosse. Also, so many avenues open up for financial help when your GPA is as high as you can keep it and you do well on the SAT/ACT. It makes coaches much more interested because as one coach told me “it shows you are serious about coming here for all 4 years and that you have the chops to succeed”. 5. How excited are you about your future in college? I am really excited to start college and get to play lacrosse too. I think I took a long time to commit/sign but I think I found a really good fit, one that I will be successful at academically and enjoy playing lacrosse. 6. How much money do you estimate your family saving in college expenses over the entirety of your college career? Over the 4 years, it likely will add up to about 40k. 7. Would you recommend SportsForce to any other student-athletes? Why? My family would absolutely recommend SportsForce to other student-athletes. By starting with them early in 9th grade, the cost was essentially for 4 years of service rather than a blitz right at the end of high school. Also, while I did ultimately want a scholarship for athletics, SportsForce provided another outside source of motivation and accountability that helped me stay on top of my grades and ultimately receive scholarship money for my academics as well. There is no way I or my parents could have done all the research and communications with the effectiveness or ease that SportsForce provides. Darrell and Coach Ervay were patient and understanding, as well as very attentive whenever we needed something i.e. game footage compilations, questions about NCAA rules and how to get a number, as well as keeping the communications list up to date. Over the last six years, SportsForce has helped over 1,000 student-athletes and families successfully navigate the college recruiting and athletic scholarship process while saving families on average $50,000 in college expenses. 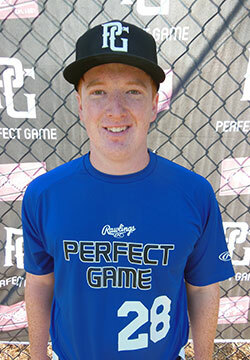 We would like to congratulate Brodie Maloney on his commitment to Southwestern University! Here are Brodie’s recruiting story and interview after his commitment. Good luck as a Pirate! I live in a small community in California that does not have a summer club team. I started traveling down to Southern California my freshman year and played for Trombly Baseball. The process was hard and long, but it was very rewarding in the end. I committed to Southwestern University in January 2018. I am going to Southwestern University in Austin, Texas. I chose SU because it was definitely the right fit for me, academically, athletically, and socially. SU had a great campus feel and it has a great baseball program. SportForce helped me understand how the recruiting timeline worked, how to communicate with college coaches, and how to keep myself in better shape. Definitely try to get on a team that goes to the AZ Fall Classic (major baseball recruiting event) and if you have good enough grades try out for the All-Academic team. Other then that never think it is too late to get interest from coaches. I am extremely excited to start my college career as a Pirate mainly because Austin is an extremely nice area and the school and baseball program are outstanding. Over 4 years my family and I will save 80,000 dollars. I would recommend SportForce to other athletes that do not have enough guidance from another coach because they helped figure out my needs and wants for college.